We zone in on the complete wetroom solution provided for the Lalit Hotel, London—one of Schlüter-Systems’ grandest projects of 2016/17 and finalist in the ‘Listed Building (Over £5 million)’ category of the AJ Retrofit Awards 2017. The conversion project took the historic Grade II listed building previously known as St Olave’s Grammar School, located at Bankside in London, and transformed it into a luxury 70-room boutique hotel that fuses the best of Indian and British culture. 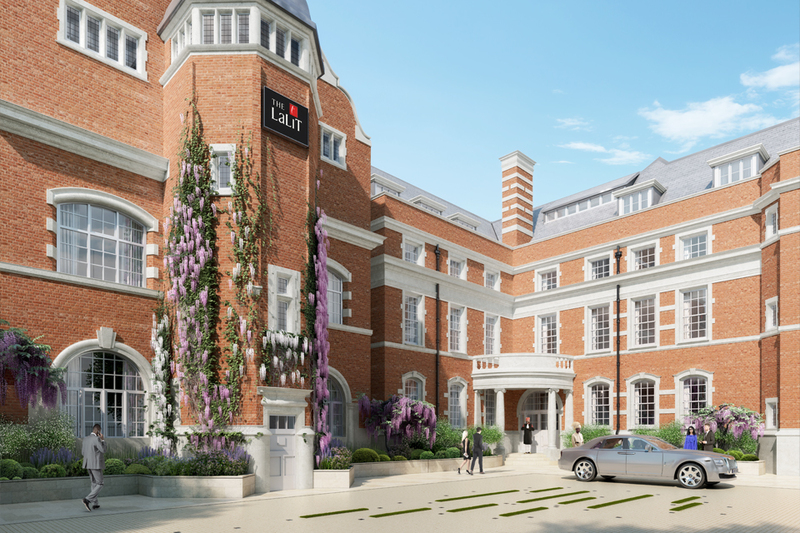 Lalit London is the 13th hotel of the Lalit Suri Hospitality Group, and the first based outside of India. EPR Architects, leading on the project, elected to utilise Schlüter’s complete wetroom system to provide secure waterproofing and appropriate drainage for each of the floor-level showers in the en-suite wetrooms. In each of its wetrooms, Lalit London features Schlüter-Systems’ integrated CE Marked wetroom solution, including Schlüter-KERDI-LINE drainage system, along with Schlüter-DITRA-HEAT-E underfloor heating and Schlüter-JOLLY/-QUADEC wall profiles. Waterproofing is an essential provision for any building that incorporates areas subjected to high levels of moisture; many of the materials available to back tiles are merely water-resistant and therefore require additional finishing processes to prevent the ingress of damp. In order to protect both the tile covering and the fabric of the impressive 19th century building, the walls of the Lalit London wetrooms incorporate the ready-to-tile waterproof foam-cored substrate Schlüter-KERDI-BOARD, providing even and secure coverage. Schlüter-JOLLY and Schlüter-QUADEC, in a polished chrome anodised aluminium finish provide use-appropriate, aesthetically pleasing protection for the small ceramic tiles that were then applied to the walls of Lalit London’s wetrooms. Schlüter-KERDI-LINE is a component linear drainage system for the construction of floor-level showers with ceramic tiles and natural stone. It consists of a formed stainless steel channel body with a grate and frame structure that can be seamlessly adjusted to the thickness of the covering, from 3 to 25 mm. Both horizontal and vertical drain variants were used in the Lalit London project, complemented by the designer frameless channel cover, Schlüter-KERDI-LINE-D, which allowed for the subtle blending of drainage provision with the patterned unglazed vitrified tile used for the wetroom floors. Schlüter-DITRA-HEAT-E incorporates uncoupling and electric underfloor heating into one solution, which is fully compatible with Schlüter’s wetroom systems and keeps assembly heights to a minimum. This last factor is particularly useful in the case of renovation projects, in which build-up often has to be minimised to ensure flow from room to room. Use of one manufacturer as the source of your wetroom system results in a solution that is guaranteed to last and easier to specify; with Schlüter-Systems’ assistance, Lalit London’s wetrooms are both beautiful and practical. For more information on how Schlüter-Systems can help with your tile and stone projects, call 01530 813396 or email pr@schluter.co.uk.